I have seen plenty of articles and blog posts out there for how to setup and implement table partitioning, but very few for removing or undoing it. So I thought I would cover a few ways to accomplish this while still preserving the data. There could be many reasons for removing partitioning: no longer needed, need to change partitioned tables, etc. But for our example, we just want to completely remove it from all tables. It would be nice if we could just drop the partition function and partition schema and SQL Server would handle all the rest, but it just isn’t that simple and that’s why DBAs were created. The Problem – We have two partitioned tables (PartitionTable1 & PartitionTable2) split across four filegroups. We need to remove partitioning from the tables, remove the four files and filegroups, and then move all data to the PRIMARY filegroup without losing any data. Sample Database – Start by creating a test database with a few filegroups and add some data files to those filegroups. — Create a test database. — Add four new filegroups to the PartitionTest database. — Adds one file for each filegroup. Create our partition function and then our partition scheme. Create the partitioned tables on the partition scheme; one (PartitionTable1) with a clustered index and one (PartitionTable2) with a non-clustered index. Now add 2000 rows of dummy data to each table. The random date generator code is courtesy of Latif Khan. Let’s query the sys.partitions table and see what we have created. 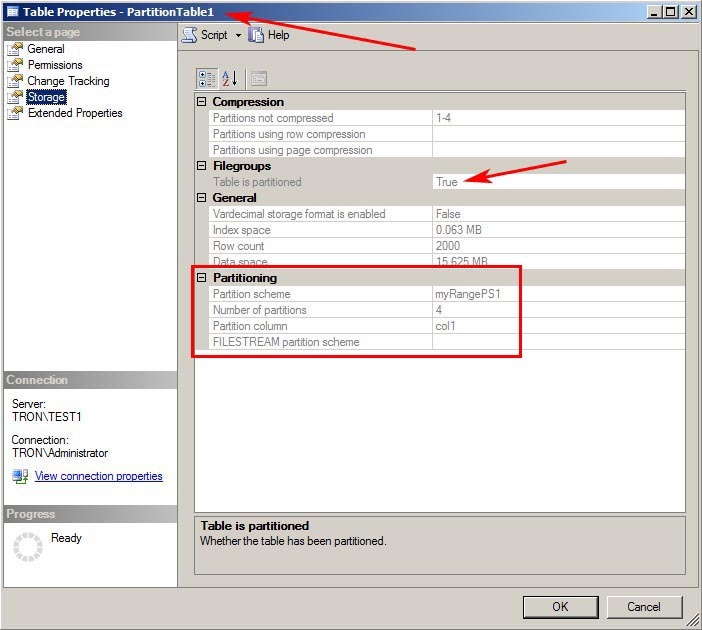 Here we can see both PartitionTable1 and PartitionTable2 are evenly split with 500 rows in each of the four partitions and each in a separate filegroup. 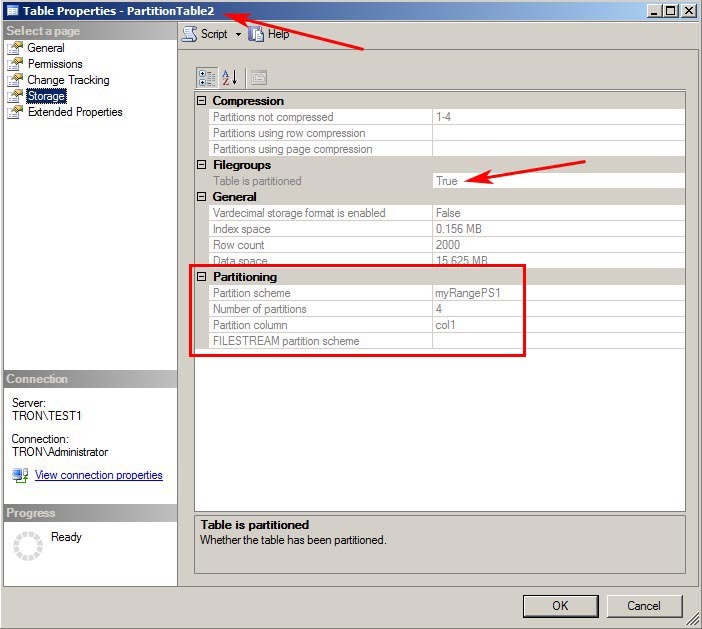 Within SSMS, you can also see each table is showing the partition scheme and the four partitions. Solution for PartitionTable1 – This table has a clustered index which makes our solution pretty easy. Since we have a partitioned clustered index, we can remove partitioning from this table by simply executing a single statement; CREATE INDEX using the DROP_EXISTING option and specifying a different filegroup. This will drop the current partitioned index (which includes the data) and recreate it on the PRIMARY filegroup all within a single command. — Quick and easy way to unpartition and move it. Now query the sys.partitions DMV again and you will see PartitionTable1 no longer shows up and only PartitionTable2 is remaining. Once again in SSMS, you can will see PartitionTable1 now resides on the PRIMARY filegroup and its data still remains intact. Solution for PartitionTable2 – We can’t use the previous index trick on the this table because it doesn’t have a clustered index. For this solution, we’ll need to use a few ALTER commands such as MERGE RANGE, NEXT USED, SPLIT RANGE, and SWITCH. First we need to use the ALTER PARTITION FUNCTION MERGEcommand to combine all of the four partitions into a single partition. 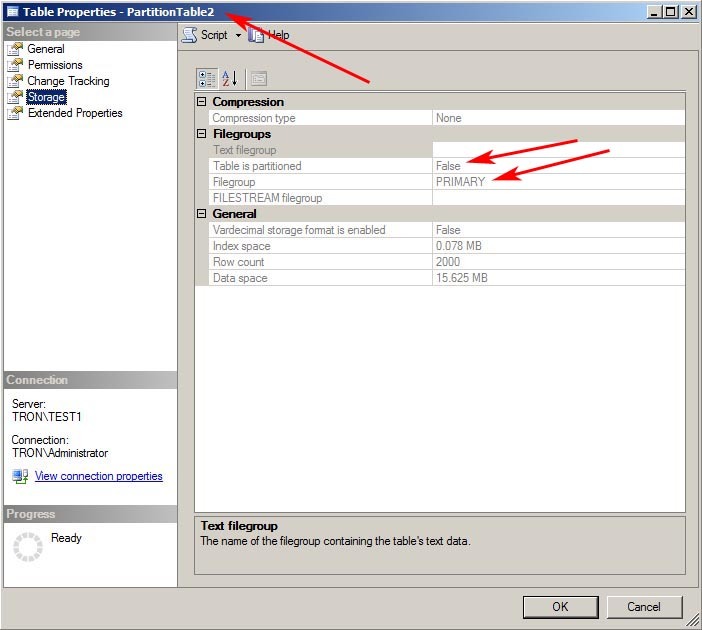 The MERGE RANGE command removes the boundary point between the specified partitions. — Merge all partitions into a single partition. Query the sys.partitions DMV again, and you will see that all 2000 rows have been combined, or merged, into a single partition and now reside on the PartitionFG4 filegroup. Next, we need to use ALTER PARTITION SCHEME NEXT USED to specify the PRIMARY filegroup as the next partition. — Create next partition as PRIMARY. Then we need to use ALTER PARTITION FUNCTION SPLIT RANGEusing a partition value that is larger than the maximum value of your partition column. In our example, since we’re doing a RANGE LEFT partition then specifying any value greater than or equal to 2000 will do the trick. The SPLIT RANGEcommand will create a new boundary in the partitioned table. — Split the single partition into 2 separates ones to push all data to the PRIMARY FG. Query the sys.partitions DMV once again. You can see that PartitionTable2 is still partitioned into two partitions, but all 2000 rows now reside in the PRIMARYfilegroup. At this point we’re only half way done. Now we need to create a non-partitioned table in the PRIMARY filegroup that matches the PartitionTable2 in every way, including any data types, constraints, etc. This new table will only be used as a temporary holding location for the data. — Create a new temporary non-partitioned table. Next we’ll use the ALTER TABLE SWITCH command to move the 2000 rows of data into the NonPartitionTable. — Switch the partitioned data into the temporary table. Query the sys.partitions DMV again to see there are now zero rows in the PartitionTable2. The SWITCH command is very efficient because it’s just making a metadata change. Under the covers, no data is actually being moved; it’s just reassigning the partition_idof PartitionTable2 to the the NonPartitionTable object_id. If you want to really see the undercover action, then you can run this script before and after the SWITCH command to see the 2000 rows of data never leave the same partition_ids. Our data has never left partition_id 72057594040156160. Now that all the data has been moved to the temporary table, we can drop PartitionTable2 and rename the temporary table back to the original name. — Drop the partitioned table. — Rename the temporary table to the original name. At this point the PartitionTable2 is no longer partitioned. Partitioning has now been completely removed from both PartitionTable1 and PartitionTable2. We can drop the remaining parts (partition schema, partition function,files, and filegroups) of partitioning to complete the clean up. — Remove the partition scheme, function, files, and filegroups. What we’re left with is a completely un-partitioned database, and all rows of data in each table completely intact. For further reading on table partitioning, see Books Online. Thanks for writing the blog. Was very informative. All you require with partitioning. Hey patrick – How are you? Very useful and Informative Post. A small correction though, under "solution for partitiontable1", your script is refering to table "[dbo]. [PartitionTable]([col1])" instead of "[dbo].[PartitionTable1]([col1])". Append "1". Thanks for pointing that out. It should be corrected now.